This article is about the elderly Noki in Noki Bay. For the elderly Noki in Pinna Park, see Pinna Park director. 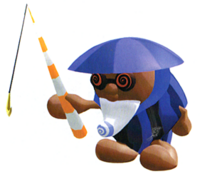 The Noki Elder (also known as Old Fisher Man or Noki Fisherman) is a helpful, fish-loving Noki who lives in Noki Bay and helps Mario during the events of Super Mario Sunshine. He meets Mario and F.L.U.D.D. when they first come to Noki Bay, explains to them that the water of the bay has been polluted, and that fishing has become impossible. He tells them that the waterfall which brings clear water to Noki Bay has been corked, and shows them the Monty Mole who he claims did it. He begs Mario to travel to the top of the waterfall and uncork it. Mario does this, but the water is still polluted. The Noki Elder continues to try to find a way to clear the water, which involve sending Mario to fight Gooper Blooper and travel underwater to battle Eely-Mouth. The Noki Elder teaches Mario how to use a diving suit to stay underwater during his battle against the Eely-Mouth. He tests him by asking him to collect all 8 Red Coins in a bottle. After the defeat of Eely-Mouth, the water is clean once again. The Noki Elder continues to give Mario hints throughout the rest of the Noki Bay missions, and after the eventual defeat of Bowser and Bowser Jr., can be seen celebrating in Delfino Plaza. The Noki Elder has a grandson who can usually be found in Noki Bay as well. This page was last edited on December 24, 2018, at 15:35.